2 of 6 Cut each slice of bread into 2 triangles. Place on baking sheet. Broil 2 minutes, until lightly browned; flip over and toast second side. 3 of 6 Bring water, lemon, salt, bay leaf and peppercorns to boiling in pot. Add shrimp; cook 3 minutes, until curled and no longer pink. Drain. 4 of 6 Mix onion, lemon juice, mayonnaise, cocktail sauce, pepper sauce and salt in medium-size bowl. 5 of 6 Finely chop shrimp. Add to mayonnaise mixture. 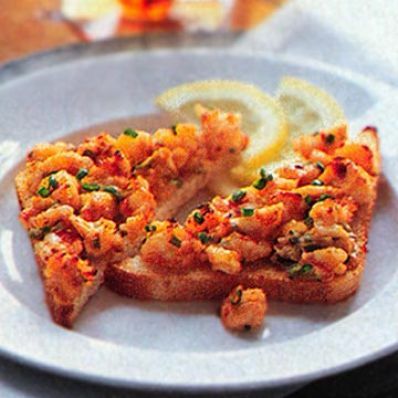 Divide shrimp mixture among toasts. Place on baking sheet. 6 of 6 Broil 3 to 4 minutes or until lightly browned. Transfer to platter. Garnish with lemon and parsley. Makes 8 servings. Per Serving: 19 g carb., 72 mg chol., 6 g Fat, total, 1 g sat. fat, 1 g fiber, 523 mg sodium, 10 g pro., 170 kcal cal.